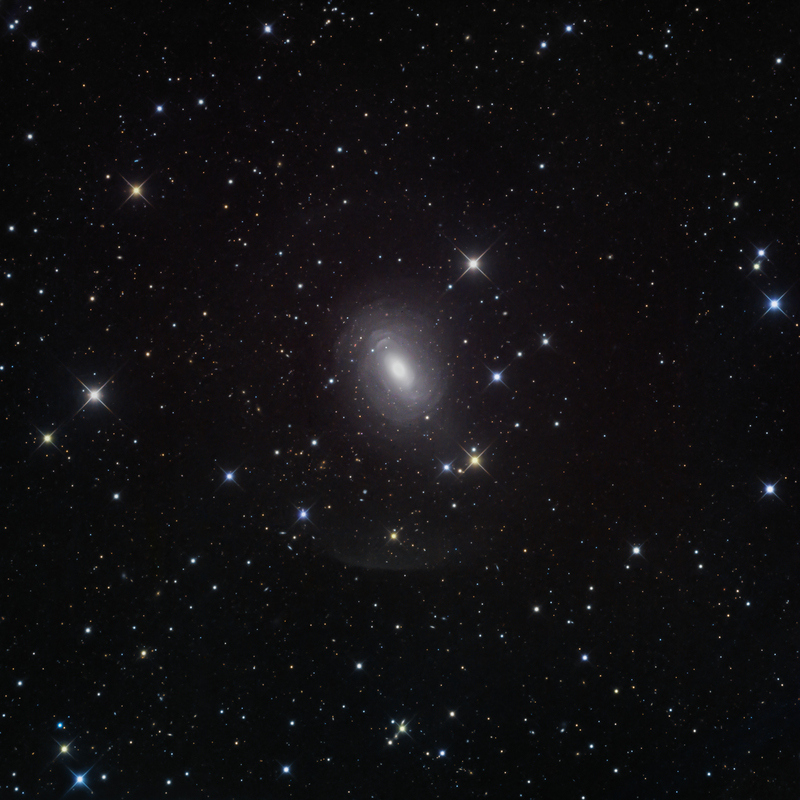 NGC 1344 is an apparently normal elliptical galaxy 60 million light years distant in the southern constellation of Fornax. It is roughly 5′ x 3′ in extent and elongated in a N-S direction. North is toward the lower right. Unusually, the bright central region is surrounded by a complex, but subtle grouping of interleaving arcs, or shells. Further out is a diffuse halo that has a brighter rim toward the NW (down). The opposite side of the halo (SE, up) is almost too faint to be obvious in this image. The halo expands the apparent size of the galaxy to about 17′ x 13′. The external shells were first revealed in NGC 1344 using the then new technique of photographic amplification developed by David Malin at the Anglo Australian Observatory (Malin and Carter, Nature, 285, 643–645, 1980). There is almost no color to the galaxy in my image, although research papers point to slight color variations. It is similar in color to the shell galaxy PGC 6240 taken by the Hubble Space telescope (link). The multiple shells are considered to be remnants of relatively recent galactic mergers, perhaps between a small disk system and a much larger elliptical galaxy. NGC 1344 is one of the best examples of a shell galaxy and its discovery inspired research to understand why these features do not form around all types of galaxies. For those of you who are interested in other shell galaxies, here is a catalog (PDF) compiled by Malin and Carter (Astrophys. J., 274, 534–540, 1983).